Why is Samsung Galaxy S9 a Worthy Rival to iPhone X? The war between iPhone and Samsung begins once again when Galaxy S9 is released. Now Galaxy S9 is here and you may have heard words like "Galaxy S9 can't defeat iPhone X as its preorders are reported down ~50% over GS8", or "Galaxy S9 kills iPhone X in 5 ways"... Which is right? Which phone is better, iPhone X or Samsung Galaxy S9? For example, while Samsung Galaxy S9 has better camera, iPhone X outweighs in facial-recognition features. There are similarities and differences among both phones. So it's your decision to make. 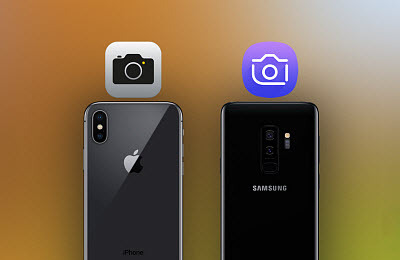 To help you make a choice between iPhone X and Galaxy S9, this iPhone X vs Samsung Galaxy S9 (Plus) comparison has the camera, battery life, performance, display, sales compared head to head, and picks the winner in each spec. Check details below. iPhone X is the most expensive iPhone. The price for iPhone X (64GB) is $999 (£999, AU$1,579), and goes up to $1,149.00 for 256GB. This price tag is daunting for many users. Users who are put off by iPhone X's can take Galaxy S9 as an alternative. Compared to iPhone X, Samsung Galaxy S9 and S9 Plus are priced at $720 (£739, AU$1,199) and $840 (£869, AU$1,349) respectively. Unlike the three storage options in iPhone X, Galaxy S9 and S9 Plus both come with 64GB storage size, but there is support for MicroSD slot that can hold 400GB data. Samsung Galaxy S9/Plus looks similar to Galasy S8, except that the fingerprint sensor is placed beneath the camera on S9. Users can hardly tell the difference by a rough look. iPhone X, on the contrary, gets a radical and unique redesign. Specifically, Samsung Galaxy S9, at 8.5mm x 68.7mm x 147.7mm (8.5x73.8x158mm for S9 Plus), is larger and thicker than iPhone X, while iPhone X is wider at 7.7mm x 70.9mm x 143.6mm and heavier (174 vs 163g). With Galaxy S9, more color options are available, namely Coral Blue, Lilac Purple and Midnight Black. Another big advantage of Samsung Galaxy S9 over iPhone X is the headphone jack. For those who care, the 3.5mm headphone jack will give them a faster conclusion on "should I get iPhone X or Galaxy S9/Plus". Though iPhone X and Samsung Galaxy S9 both have 5.8-inch Super AMOLED displays, they are not the same. 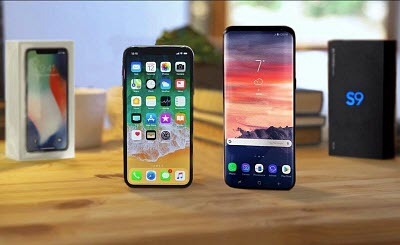 The main difference between iPhone X and Samsung Galaxy S9 screens is the display resolution. Samsung Galaxy S9 has a higher resolution (1440 x 2960 pixels/568ppi) while iPhone X is a little lower at 1125 x 2436 pixels/463ppi. Not only that, iPhone X is the first Apple phone that features the AMOLED display, which is manufactured by Samsung. With Galaxy S9, users have more freedom to set the colors which are adjusted by the True Tone automatically on iPhone X. 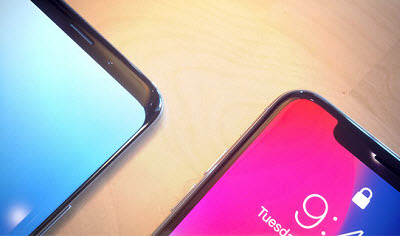 Some user may opt for Galaxy S9 over iPhone X because of the notchless display. Galaxy S9/S9+ don't have a notch, making S9 screen look bigger. The screen-to-body ratio is also higher in Galaxy S9 than iPhone X (84.2% vs 82.9%). Last year, iPhone X introduced Face ID to unlock iPhone in a new way. 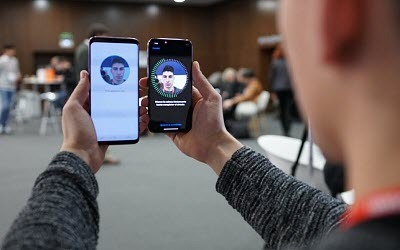 Now Galaxy S9 brings Intelligent Scan, a new feature that unlocks S9 via iris and face scanning. What are the differences when Face ID versus Intelligent Scan? Face ID will catch 30,000 infrared dots from user's face and create a 3D map that include every details of the face with the help of TrueDepth. It's the most secure face recognition tech that can defend against fake faces. On the other hand, Samsung Galaxy S9/Plus scans the face using a 2D camera, then irises. This allows the phone to unlock faster, but not necessarily securely. Samsung's face recognition tech can be tricked with a 2D image. Galaxy S9's Intelligent Scan is altogether far less secure than iPhone X' Face ID. Galaxy S9 and iPhone X have a lot of things in common, and one of the most obvious one is the AR emoji. iPhone X uses the TrueDepth camera to capture facial movement and maps them to animal faces. Lacking of dot projection facial scan, Samung's AR Emoji tracks face with a regular front-facing camera to create emojis that look like you. 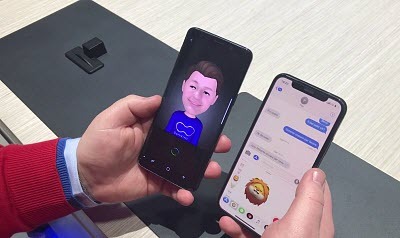 Compared to AR emoji in Galaxy S9/S9+, iPhone X animoji has more accurate and detailed facial movements. Animoji is limited to adorable emoji-style characters, but AR emoji let users to create and customized own characters. The feature, however, is less charming than AR animoji. According to users' feedbacks, the Samsung Galaxy S9 AR emoji is giving creep faces. The iPhone X vs Samsung Galaxy S9/Plus in camera is a tough one. Both phones have the top-end cameras. iPhone X packs a dual-lens 12MP camera with one f/1.8 lens and one f/2.4 lens while S9 has a single 12MP main shooter and S9 Plus has a similar dual-lens 12MP camera (f/1.5 and f/2.4). The dual-Aperture camera allows Galaxy S9 to switch between f/1.5 and f/2.4 automatically in low-light or normal conditions. Another big difference between iPhone X and Galaxy S9/S9+ is the super-slow-motion feature. Galaxy S9/S9+ can shoot super slow video at up to 960fps in 702p, while iPhone X is fixed at 240fps in full HD 1080P. On the front, Galaxy S9 has an 8MP F/1.7 camera and iPhone X has a 7MP f/2.2 one. However, iPhone X's TrueDepth camera has an obvious advantage over the front-facing camera on Galaxy S9/S9 Plus. 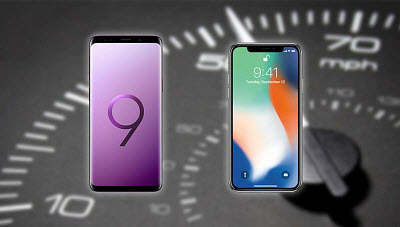 The key to the question "which phone is better, iPhone X or Samsung Galaxy S9" may come down to the speed or performance that can affect daily use. Samsung Galaxy S9 has the Snapdragon 845 and Exynos 9810 chipset with 4GB of Ram while iPhone X equips 2.39GHz hexa-core A11 Bionic chipset, 3GB RAM. Tests show that iPhone X A11 Bionic is faster than Galaxy S9, with scores of 10,357 and 8,295 respectily in the Geekbench 4 test. While Samsung Galaxy has higher scores than iPhone X in the 3DMark's Sling Shot test, iPhone X is faster converting 4K videos. Overall, iPhone X shows a faster performance than Galaxy S9/S9 Plus. In terms of software, the winner in Android Oreo 8.0 vs iOS 11 will mainly depend on user preference. Both operating systems have their unique features that can't be replaced. 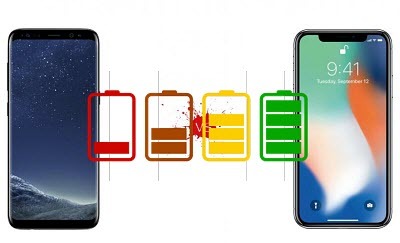 Galaxy S9 and S9 Plus have a battery life of 3,000mAh and 3,500 mAh respectively, compared to 2,716mAh in iPhone X. It seems that Galaxy S9 has a bigger battery than iPhone X, which claims to have longer talk time (22 vs 21 hours) as well. The numbers don't mean the final verdict. iPhone X has integrated its hardware and software to improve the iPhone battery and give an similar battery life at even a smaller battery size. According to early tests, it's very likely to get the pretty much the same results. By now, we will wait to see if Samsung Galaxy S9's bigger battery will run longer. Also iPhone X and Galaxy S9/Plus support fast charging and wireless charging. If any of the iPhone X vs Samsung Galaxy S9 differences sway you, say the price, the camera or the Face ID, just go to get it. If you're still wondering "should I get iPhone X or Galaxy S9/S9 Plus? ", our suggestion is to wait for a for more reviews on performance than specs. Besides those feature similarities and differences between both phones, you may also need to consider the resource that can get on each phone. Anyway, after we have talked so much, the decision may still rely on your user preference though. If you choose iPhone X over Samsung Galaxy S9/S9+, you will need this super-fast iPhone manager to backup and transfer bulk photos, music, video, iTunes purchases, ringtones, iBooks from iPhone to Mac/PC and vice versa. World's No.1 speed without any quality loss!